Surface Conditioners | Loxeal S.r.l. A good bonding starts from cleaning the parts carefully, in order to allow the adhesive to create chemical and physical conjunctions. Loxeal Cleaners degrease and clean to prepare surfaces before adhesives application. They remove also oxidation caused by air and humidity. Loxeal activators allow anaerobic and cyanoacrylate adhesives to cure when environmental and operative conditions are critical. Solvent based treatment for bonding of polyolefin (polyethylene, polypropylene), thermoplastic rubbers, EPDM, PTFE, silicones and other difficult to bond materials. Polyolefin Primer is recommended to be used with Loxeal 34 Instant Adhesive. Cleans, degreases parts and speeds up the setting time of cyanoacrylate adhesives. Curing effect is obtained in 1 – 4 seconds depending from type of adhesive, gap between parts and surfaces composition. The Activator is applied on one surface and let to dry for a few seconds. 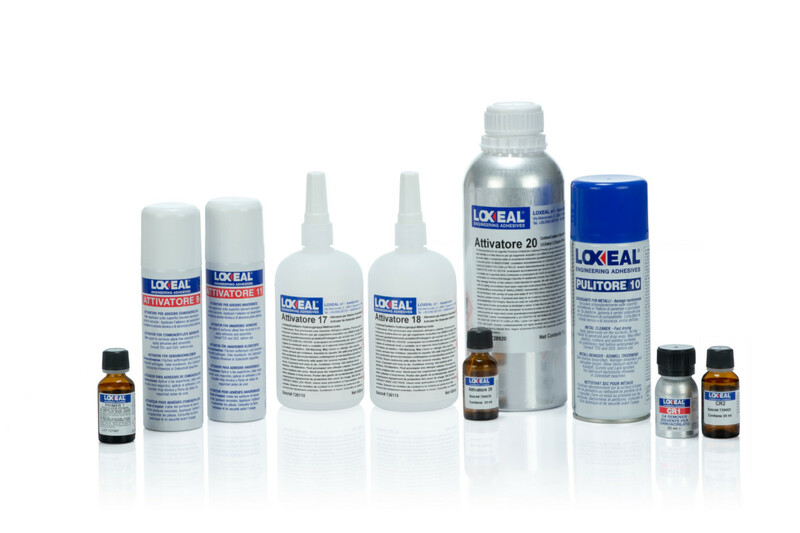 Loxeal CA Remover is a solvent blend to be used to remove cured cyanoacrylate adhesive from surfaces, clothing or to debond parts assembled with cyanoacrylate adhesives. Loxeal CA Remover CR2 is a solvent-free non-flammable blend to be used to remove cured cyanoacrylate adhesive from surfaces, clothing or to debond parts assembled with cyanoacrylate adhesives. Long lasting removing action due to effective dissolving over time. Designed to improve operating conditions of operators, with particular care for their health and safety, CA Remover CR2 doesn’t report on label any risk phrase or symbol because it is not classified as dangerous, according to actual directive on dangerous products. It cleans, degreases parts and speeds up anaerobic adhesives and sealants fixture time. Curing effect is obtained in 20 – 120 seconds depending on type of adhesive, gap between parts and room temperature; wait for solvent evaporation before assembling parts. It can be used either on flange or threaded joints; its use might reduce final mechanical strength. Solvent free Activator to speed up the setting time of anaerobic adhesives and sealants. Curing effect is obtained in 20 – 120 seconds depending from type of adhesive, gap between parts and room temperature. Apply the Activator to one surface and the anaerobic Adhesive to the other one. As it is solvent free there is no need to wait before assembling; it’s not harmful. It can be used either on flange or threaded joints; its use might cause a lowering of final mechanical strength. To be used with acrylic adhesives and with anaerobics. Apply the Adhesive on one part and the Activator on the other; assemble parts and wait few minutes to achieve fixing. Non-CFC solvent based formulation for cleaning and degreasing of surfaces to be bonded or sealed with Loxeal adhesives or sealants.